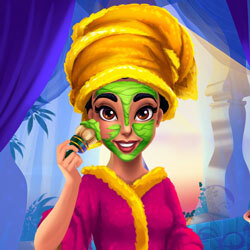 Description: Enter a whole new world of beauty treatments with the elegant Arabian Princess and join her at the Sultan's palace. Apply creams and masks, then head over to the makeup session to give her a complete new look. Once you're done, pick a marvelous outfit for the princess to set out on a new adventure.